Explanation: Where did the gold in your jewelry originate? No one is completely sure. The relative average abundance in our Solar System appears higher than can be made in the early universe, in stars, and even in typical supernova explosions. Some astronomers now suggest that neutron-rich heavy elements such as gold might be most easily made in rare neutron-rich explosions such as the collision of neutron stars. 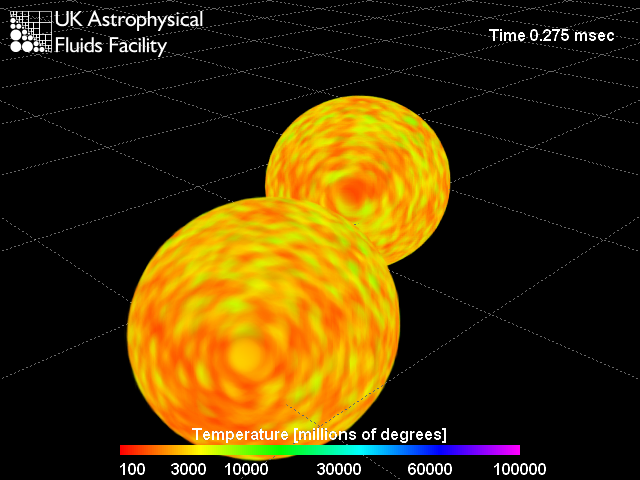 Pictured above is a computer-animated frame depicting two neutron stars spiraling in toward each other, just before they collide. Since neutron star collisions are also suggested as the origin of gamma-ray bursts, it is possible that you already own a souvenir from one of the most powerful explosions in the universe.